This summer we went to the Adirondacks, our first time. It's such a huge area, that I will do several posts about our time there, but for those of you looking for a getaway that might involve skiing, definitely some snow activities, and a perfectly done lodge, I have the place. Whiteface Lodge is in Lake Placid, which is pretty much in the middle of the Adirondack State Park, which is 6 million acres, and, according to Wikipedia, that's the size of Vermont. So it's huge. To get to Lake Placid, home of the Winter Olympics of 1980, you should plan about 5 hours--it's 288 miles. It's straight up the Thruway, which they call the Northway once you hit the Adirondacks. It's really like you're in a different state, and one that's very far away. No mini malls. Lots of businesses that have been family run since the 40s. No bad developments. But back to the Whiteface: an Olympic skier who became an entrepreneur, concepted the place, wanting to have a lodge that harked back to the great camps that were so prevalent in the 19th century. 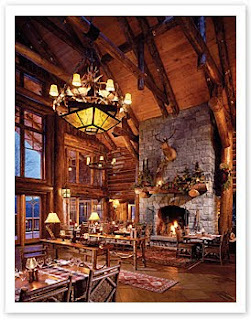 It's totally grand in its huge beams and high ceilings, but also very cozy with lots of wood and fireplaces. The rooms are nicely appointed, the beds comfortable, and a family of four could easily fit into a one bedroom suite, the smallest room, as it has a queen size bed, and a queen size pullout couch. I just looked online, and they have a winter special, that has a winter rate of $395 per night over the weekend, and that includes breakfast, and all of the amenities they offer. Now usually, I don't get too excited about those, but listen up: movie theater, game room, indoor and outdoor pool,bowling, ice rink, kids club, complimentary shuttle into town (which has no parking so you will actually use this), free valet...and the best part? They have a washer/dryer in the common area, with complimentary laundry detergent! I couldn't believe it. The food at Whiteface is excellent--we loved the breakfasts--granola, eggs, pancakes, waffles, organic yogurts, juices...etc...it isn't a skimpy free breakfast. We didn't eat lunch there, but dinner was great. They have a bar area where they have some live entertainment (it was a great singer/guitar player one night, and the next it was a little hokey), and we just got drinks, and a pizza for Clara, from their wood burning oven. They have a nice menu for kids, which is a step above average--good quality version of the classics. The wine list was great. And it's in the middle of everything--which you'll read about on the next couple of posts.